New York Comic Con is in full swing starting this morning, and a big announcement was already made on the first day. Dark Horse Comics is developing a comic book series based on James Cameron's blockbuster Avatar movie and its upcoming sequels. While director James Cameron wasn't present at NYCC 2015, he did appear in a special video that fans saw at the Dark Horse panel earlier today. Take a look at the video below, courtesy of Entertainment Weekly. 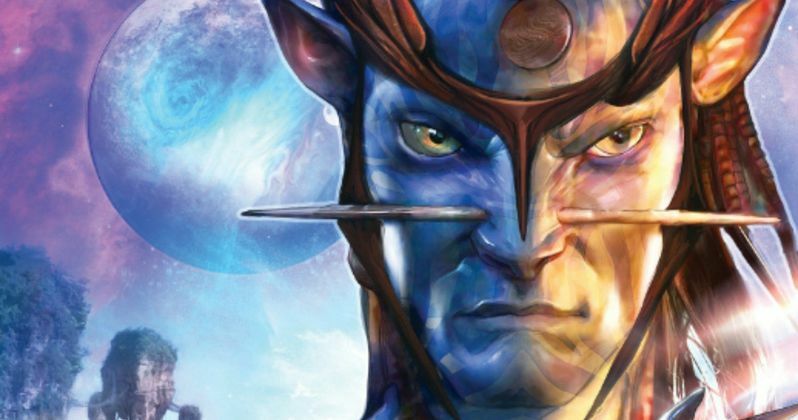 "I'm excited that starting now, even before the release of the first sequel, Dark Horse Comics will be bringing you new adventures from Pandora, covering the time before, during, and after the events of the original Avatar film. For the past 27 years, Dark Horse has been associated with my films The Terminator, Aliens and The Abyss. Now they're working directly with me and our team at Lightstorm in an unprecedented ten-year partnership that's going to create new stories that will take you deeper into the world of Avatar." We reported in January that all of these Avatar sequels were pushed back by a full year. James Cameron is currently in pre-production on Avatar 2, Avatar 3 and Avatar 4, which are currently scheduled to hit theaters in 2017, 2018 and 2019 respectively. Star Zoe Saldana revealed last year that all three sequels will be shot back-to-back, with production expected to span between eight and nine months, although it still isn't clear when principal photography will begin. Sam Worthington, Zoe Saldana and Stephen Lang are expected to return for these sequels, although it isn't known if other Avatar cast members are scheduled to reprise their roles. James Cameron is directing all three follow-ups, from scripts he co-wrote with Rick Jaffa and Amanda Silver (Dawn of the Planet of the Apes), Josh Friedman (War of the Worlds) and Shane Salerno (Savages). James Cameron will also produce alongside his Lightstorm Entertainment partner Jon Landau. It isn't known yet when these Avatar comics will be released, but stay tuned for more information. In the meantime, you can check out James Cameron 's video announcement below, along with the first look at promo art for the comic book, directly from the NYCC floor. Are you excited to explore the world of Pandora through these new comics?